We’re proud to announce that Grillo has earned another Angie’s List Super Service Award, reflecting an exemplary year of customer service in 2016. This achievement is particularly significant as Angie’s List experienced unprecedented member growth in 2016. More than 1.6 million consumers, many of whom were eager to hire highly qualified service pros, joined Angie’s List after the company added a new, free membership tier. 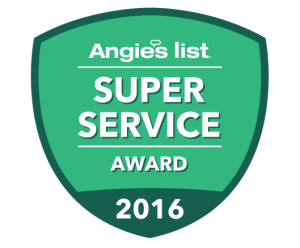 Angie’s List Super Service Award 2016 winners meet strict eligibility requirements, which include an “A” rating in overall grade, recent grade, and review period grade. The SSA winners must also be in good standing with Angie’s List, pass a background check and abide by Angie’s List operational guidelines. Ours is not a fancy address by design; to save you money and give you the best value. Service company ratings are updated daily on Angie’s List as new, verified consumer reviews are submitted and added to the 10 million verified reviews it already has. Companies are graded on an A through F scale in areas ranging from price to professionalism to punctuality. If you want to add your review about Grillo to Angie’s List, you can use this direct link to their website. You will need to create an account so they can verify reviews come from real consumers. Angie’s List helps facilitate happy transactions between more than 4.5 million consumers nationwide and its collection of highly rated service providers in more than 720 categories of service, ranging from home improvement to health care.